National Trail pitcher Davlyn Werner delivers a pitch during the Blazers regular-season finale against Tri-County North on Monday, May 7. Trail suffered a 11-1. loss. 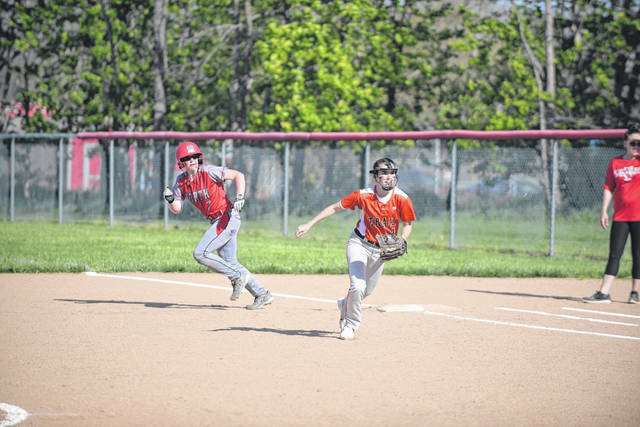 PREBLE COUNTY — Eaton’s varsity baseball team opened the post-season with an exciting win over West Carrollton on Tuesday, May 8. The Eagles score twice in the bottom of the seventh to take a 7-6 win and advance to the second round of the OHSAA Division II District Tournament. Eaton led 5-4 going into the final inning, but allowed West Carrollton to score twice and take a one run lead. The Eagles, however, rallied in the bottom of the inning, helped by a WC miscue that proved to be the game-winning play. With Tyler Earley and Alex McCarty on base, Owen Baumann got the game winning hit. Earley score easily on the base hit and McCarty scored the game winning run on a throwing error. Travis Pittman pitched into the seventh inning, before giving the ball up to Zac Schmidt who finished. Offensively, Brandon Miller and Jordan Lewis each had two hits. The win advanced Eaton into the second round where they faced a familiar foe in Bellbrook on Thursday. The Eagles split their two previous meeting with the SWBL opponent, with both teams winning at home. Both teams played even through four innings as the score remained 0-0. But Bellbrook scored six runs in the final three innings to take a 6-0 win. Eaton finished the season 8-11 overall. No. 8 seed National Trail’s baseball team fell to No. 11 Brookville, 4-1, in the second round of the Division III tournament on Wednesday, May 9. No. 19 Preble Shawnee rallied from a double-digit deficit to push No. 3 seed Carlisle, but came up short in a 16-8 loss, in the second round of the Division III baseball tournament on Wednesday, May 9. The Indians scored 12 runs in the second inning to take a 12-1 lead. Shawnee was able to cut the lead to six twice. The Arrows opened tournament play with a 5-1 win over No. 21 Houston on Monday, May 7. Twin Valley South’s baseball team had its season come to an end with a 13-3 loss to No. 10 seed West Liberty-Salem on Monday, May 7. Preble Shawnee fell to No. 5 Carlisle 7-1 in the second round of the Division III softball tournament on Wednesday, May 9. 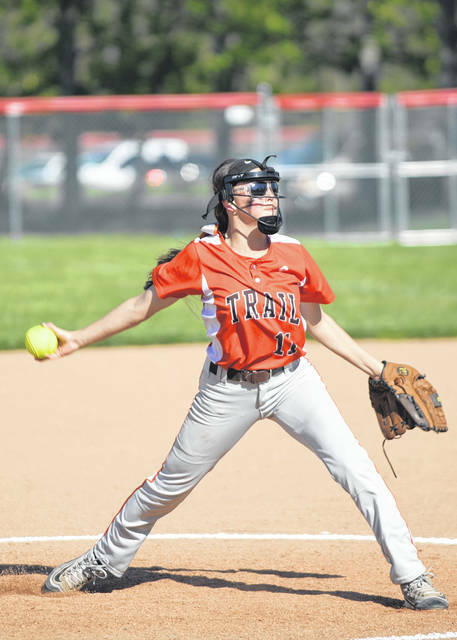 National Trail rallied from a 5-1 deficit but came up short in a Division III softball tournament game. Trail, the No. 7 seed, had the tying run on base in the seventh in a 5-4 loss to No. 3 seed Arcanum. No. 20 Twin Valley South couldn’t keep pace with No. 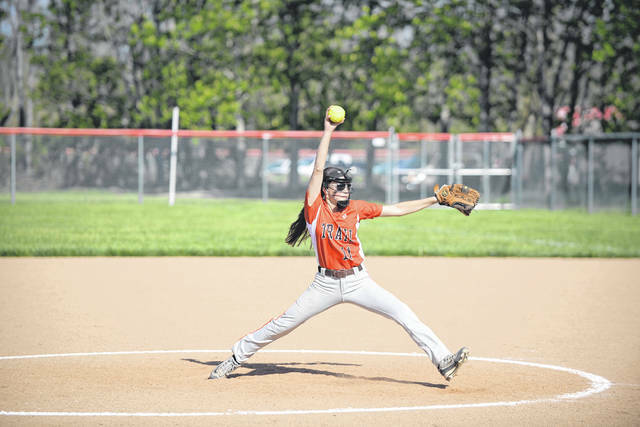 10 Fort Loramie in a first round game of the Division IV softball tournament, falling 20-6.
https://www.registerherald.com/wp-content/uploads/sites/41/2018/05/web1_ntsb3-1.jpgNational Trail pitcher Davlyn Werner delivers a pitch during the Blazers regular-season finale against Tri-County North on Monday, May 7. Trail suffered a 11-1. loss.